That's some awesome work you made there, Fluffybumthecat! I sent a pm to you 1 1/2 weeks ago about possible work, but I just read that the email notifications on Qhimm isn't working right now. So I'm alerting you to the mail via your thread instead. If you haven't noticed it yet, please check your messages for the mail I sent 12 days ago. =) Please send a reply via personal message and not on the forum. General discussion / Re: Q: Where are red field arrows/triangles stored? Turns out the problem solved itself. Naturally the text becomes jibberish when moving the JORG ONNA_1 .DAT file into the English game. I then noticed that after changing the jibberish into normal text, red arrows will appear or disappear on the field. Anyway, if you make sure to remove the jibberish from all the text entries, no red arrows will appear so that solves my problem. I am modding back the Honey Bee Inn lobby into the English game, by replacing the English ONNA_1 .DAT file with the one from the Japanese Original (JORG). However I noticed after doing this that two red exit/entrance arrows appear. I have already ruled out the BSX and MIM files as possible candidates, as these have not changed in file size between JORG and the English game. I assume of course that the red arrows do not exist as unused graphics in the original game. I have noticed this thing http://wiki.qhimm.com/FF7/Field/Script/Opcodes/0F_SPECIAL/F5_ARROW of course but I don't know how to use this info. It is indeed a great field image. You never see the top of the mountains or the sky for that matter when playing the game normally. General discussion / Re: Q: "Text ID# Shift Mechanics"
Ok, that confirms to me at least that we don't know for certain either way if the called text entries were adjusted etc. But there are two other items of interest. We already know from the messed up kanji in the fields ONNA_1, ONNA_6, BLACKBGA, WHITEBG1 (and JUNBIN21 in the original JP release) that when additional kanji were added to the kanji table, this shifted the symbol identification numbers which led to the aforementioned fields displaying the wrong text. That much we are on the clear. The second item, which causes me some wonder though, are the Field IDs. As most of us here know (I think), the fields are generally ordered in a way that represents the progression through the game from beginning to end. However, after Field ID#768 (LASTMAP), random fields are added. Fields from throughout the game, with the ID numbers 780-786 representing the scenes that were added after the original Japanese release. I have always figured that these fields were given high numbers, rather than being placed in the "group" where they belong, so to not shift the Field IDs and thus avoid erroneous map jump commands. Do we have anything to support this notion that an added Field in the middle of the list would cause faulty map jumps, due to these (presumably) not being automatically adjusted in the script? Do we have any way to know if the developers used software that adjusted the Text IDs accordingly, when text entries were deleted? Or is it all speculation if they avoided deleting text entries (even unused ones) so to avoid having to adjust the called text entries manually, one by one? The game has no way of knowing in advance what the id points to, or if it's even valid at all. Could the developers of FFVII have deleted all the unused text entries without having to adjust the Text ID# called for in the scenes of those fields? On one hand it sounds to me like they did not delete the text entries so to avoid the Text ID# shift problem, on the other hand deleting unused text entries in Makou Reactor causes no trouble. The answer to this question is important for the commentary in the next Unused Text article that I am about to publish. 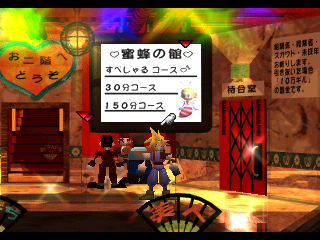 I had long assumed that removing or adding new text entries into the FFVII fields would cause text to be triggered at the wrong instances, as I figured that the game's scenes will not adjust which Text ID# it calls for. I thought this was at the very heart as to why so many unused text entries exist; because deleting them would require fixing up all the text calls. However some experimentation in Makou Reactor 1.4.1 has made me confused. The program only claims that problems will arise if I delete a text entry that is USED. Adding new text entries or deleting unused ones led to no objections, neither when I did it in Makou Reactor or tried out the effects in a modded game. All signs point toward the Sleeping Forest once leading to the Ancient Forest, which in turn then led you out to Coral Valley. I'd rather implement this than create completely new caves. But at present I'm more interested in finding the coordinates to properly teleport on to the walkmesh where the unused cave exit/entrance is. However, all my attemps to teleport to the right spot have failed. 1) Areas and their field identification numbers being generally ordered in the same order that you visit them throughout the game and the ancient forest being placed after the sleeping forest and before coral valley. 2) Unused "Ancient Forest" tutorial text in Bone Village. there'll be nothing to fear. 3) The monster attack IDs, which also line up with the Ancient Forest theory. One of the guys at thelifestream.net found out that a different version of the unused Honeybee Inn room where you can see a TV is featured in the "Plate falling" FMV. I told DLPB about it already. Don't know how many others know of the connection. Because of I'm not a English speaker, someone can explain for me? What does ultima espio curse? He want to say that we never have those discs? Espio is not cursing. He is happy about your/our finds. He is also saying he wishes there were more than just those Cloud, Aerith and Barret sprites. Demo means Previw version in Tobal No.1? I had done it a little in April. But I became busy, I forgot all. ほうそく (Law? ), かなでる (Play? ), おどる (Dance), ふうじる (Seal) & ペースト (Paste). Yes, the preview version in Tobal No.1. Interesting stuff you found there. If I understand this correctly, the "Zangan Text" is not the actual full table used in the final game? It differs from the final result? Could it perhaps be used to correct the Honey Bee Inn text? EDIT: The more I look at it, the more it seems like this is what you've been doing. Mind showing the corrected versions when you find them? Edit: Just reuploaded the images after noticing some errors with my past saves. It's a TIM-format image. Easy to view and select the correct palettes with a TIM viewer. I tried this TIM viewer now. But PowerArchiver won't unpack WINDOW.BIN (I assume unpacking these is impossible). Scanning the raw file with the TIM viewer yields nothing for me. 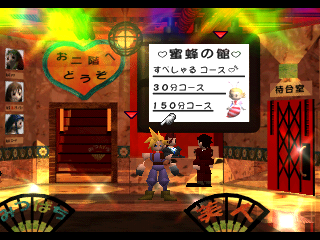 The Japanese FFVII demo from 1996 has some neat stuff in its WINDOW.BIN file. Only problem is that the colors are messed up due to tile molestor not being adapted for the PlayStation. I have long searched for something that could do the trick for this demo but to no avail. If anybody knows how to print this with the correct palette I'd be extremely thankful. 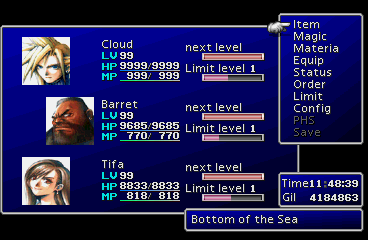 It would be a neat resource to finally have those chibi versions of Cloud, Barret and Aerith. In case you don't have the WINDOW.BIN file here is a download link. General discussion / Software to change field names within flevel.lgp file? Unable to search for related topic. The desire is to change the following field names in the PC version back to their PSX counterpart. I am unable to find a field-name-edit function in Makou Reactor. Anybody know existing software or methods to change the field names? If I can have my way, the TLS store will be removed. As the site's new Content Coordinator, it is my role to look at these things. I'll see what agreements I can reach with the other site staff. I am the buyer. I will post a review on thelifestream.net some time after I have received the DVD. Edits: Thanks for making this item known to us. 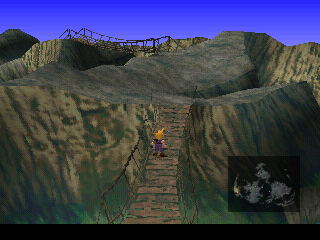 General discussion / Re: Why no menu access on Wutai continent bridges? Thank you greatly for your contributions, Asa! I had no idea about the unseen "Sea" location name. This is very good stuff. No mods. 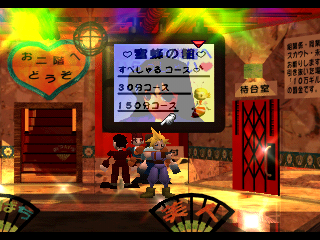 I'm playing the PSX version, without modifications. I'm simply curious about why the game acts the way it does. If you walk on the bridge, you can't access the menu. BrutalAl has a theory though. It might be that your height, Z-coordinate, is not saved. Because of this, if you entered the menu or a battle, once you left the game would not know whether you were standing on the bridge or not. There are some glitches you can find if you have a chocobo under the bridge and then walk on the bridge, then press the button to mount the chocobo and then dismount. If you do it right you won't be able to move. A chocobo who is under the bridge is in general in your way when you walk across the bridge. So he concludes that there is an obsolete z-coordinate detection going on. Had you been able to save your game on the bridge, then load that save file, you might end up below the bridge, or not able to move at all. General discussion / Why no menu access on Wutai continent bridges? Does anybody have a technical explanation as to just why the menu can't be accessed in these parts? The bridges lack random encounters as well. Same question can apply to submarine/underwater area. Why is there no menu access and could there be a way to make the menu accessible? Would you see the otherwise unseen location name, "Bottom of the Sea", or would you not see it because you are not standing on the ocean floor? Tiny Bronco and the Highwind fall into this cateogory as well. What location name would you see if the menu access was not disabled?